I spent quite some time lately trying to do all of sort of things with USB and Python. I will put out what I've learned through this course. Ofcourse I could use Pyusb or some other library but where's the learning in that? As the Brits say: give a man a fish and you feed him for a day; teach a man to fish and you feed him for a lifetime. I initially wrote this article with the title "Python detection of USB storage device". After some time of working with UDisks2 and Dbus however I found out that the code tends to be very ugly and unexpected behaviours occur (not sure if it's because of Dbus or UDisks2). So if you want to control an input/output device like a USB device or get events, I recommmend you use pyudev straight away! I will probably write an article on how to use that too. If you want to use DBus for educational purposes or want to use it maybe with some other software, please continue reading. Now, depending on how old your Linux distribution is you might have udisks or udisks2 (fourth process) and then you have the udev daemon (second process). But what do these daemons do? Well let's check for ourselves, shall we? On a sidenote (in case you're wondering) the KERNEL[blah blah] messages that appeared on the udev terminal, are Netlink messages sent from the kernel to udev. So what does udev do then? Well udev's main work is to populate the /dev folder on your root directory. So it's kind of a discovering daemon that tells the kernel what devices are connected and where. That's all! Talk directly with the kernel with Netlink messages. In this case we essentially place ourselves in udev's position. The kernel way is probably the best but is probably a hell to get working since it's so low-level. You need to deal with raw sockets since that's how Netlink communication is done. The good thing with this approach is that you are not dependent on anything more than the kernel itself. So it's pretty hard that something will break and you can always be sure that your solution will work for any distribution. udev is probably the best practical solution. It handles the messages sent from the kernel so we don't need to handle them. We only use a udev library and that's all. From what I am aware all major Linux distributions use udev so you're not going wrong with this solution. The only bad thing (and this is my own opinion) is that the udev library bindings for Python don't come with Python so you need to install them on your system on your own. Dbus uses itself udev as we mentioned earlier so it has already a dependency. However as we sayied, pretty much all distros use udev so that shouldn't be a problem. The main good things with Dbus is that the dbus library comes with Python (both 2 and 3) so you can start coding directly without having to install a bunch of stuff. An extra good thing is that maaaaaaany programs use the Dbus protocol so once you learn it, you can potentially access a lot of things. The bad thing with dbus is its ugly design (my opinion again). In this tutorial I will talk about dbus since it's one of the things that you learn once and can use in many different situations in the future. Choosing Dbus means we will have to learn a bit on how Dbus protocol works and then try and find out how udisks uses dbus. I will try to make this as easy as possible even if it's a quite hard task considering how sparse information is and how ugly some things in dbus are. As you see there are two dbus-daemon running, or three in this case. Omit the third one (no idea what that is). The two main daemons are the first two. Notice the --system in the first one and the --session in the second. These are exactly what you might guess they are.. The first one keeps the system-wide freeway and the second keeps the session-wide freeway. I think it's time we drop the 'freeway' word and use bus instead. Now each freeway has its own rules. 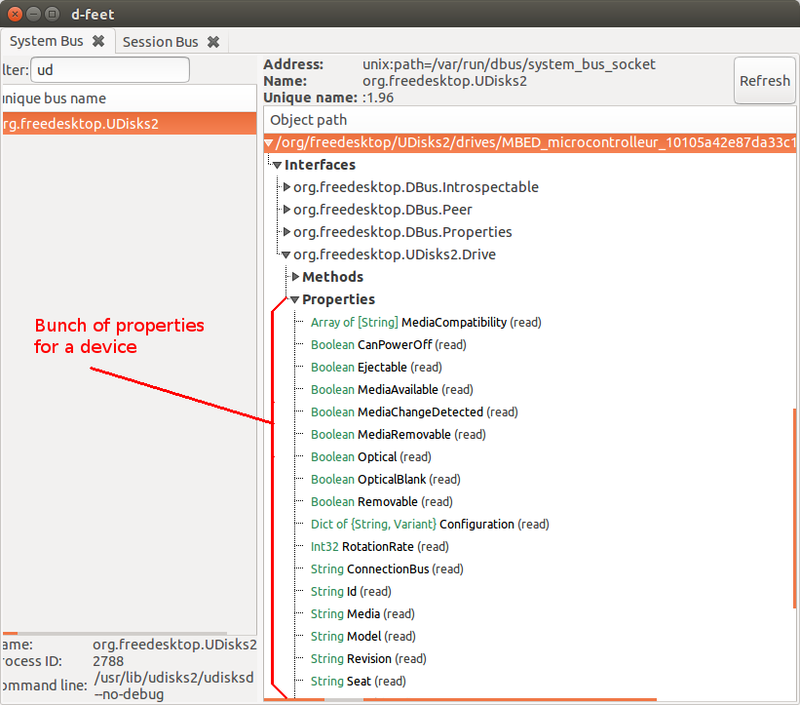 Furthermore, each program using dbus, can setup its own rules. All these rules are of the type "root can send this type of message" and "any user can access this type of message but not send this type", etc. Notice that in some cases we get domain looking strings and in some cases we get weird numbers like ':1.83' and ':1.128'. These are pretty much the same thing as domains and IP on the internet. In this case however instead of the domain/IP pointing to a host, they point to a program on our computer. Ofcourse the number ":1.128" is quite cryptic and there's actually no way to know which program it resolves to. But that is fine since the programs that are meant to be accessed, are given domain-like names just so that we can find them easily. On a side-note, you might feel tempted to access all this via Python or by using the terminal. Do your self a favour and don't. I already took that path and there are just too many issues you might run into that you'll never be able and truly understand how things run without getting in the low-level source code. All these things are pretty random and make little sense. However that's the API that we have for DBus so if you want it you have to bare with me. You just have to learn how to find each one of them and then how to use them in your Python program to access the property or method you want. You will be using d-feet to locate all these four things! The method I want to run in this case is GetDevices(). However in order to run it I have to locate all the other things: the program, the interface and the object path. Just looking at the snapshot it's easy to see where all these are located. As said, you just have to get used to finding them for any program. 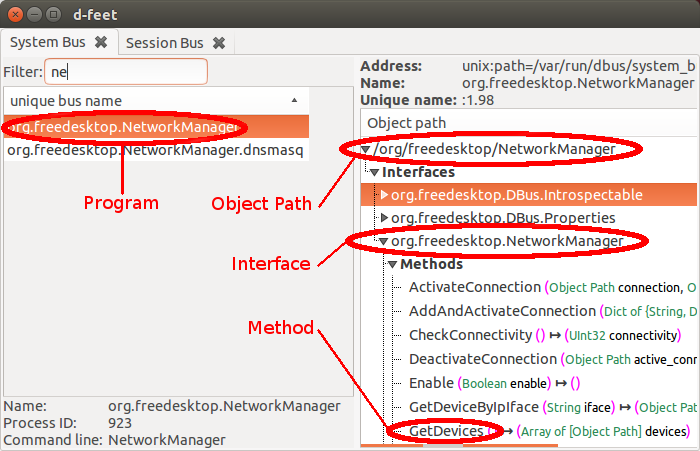 Where 'org.freedesktop.NetworkManager' is the program's domain and '/org/freedesktop/NetworkManager' is the so called object path. There is no real logic as to what an object path is. It's just some bad implementation in the core, where someone tried to bring object oriented coding into Dbus which is written in C. What came out of this effort is this monster of illogical terms that just don't fit together and just complicate things. However we have to learn all this if we are to use Dbus. Now if you are a person that spots things, you probably noticed that we didn't enter the Interface (which happens to look exactly like the program name) anywhere in our code. So how come the code works when I just stated that we always need 4 things? Well.. it's one of those bad designs. The reason it works is because the dbus library tries to "guess" which interface you want to use. In this case it was right. However many times it doesn't work and you will run into problems that are really hard to debug. So a friendly advice is to ALWAYS give the 4 things mentioned. FOUR IS THE NEW FIVE. 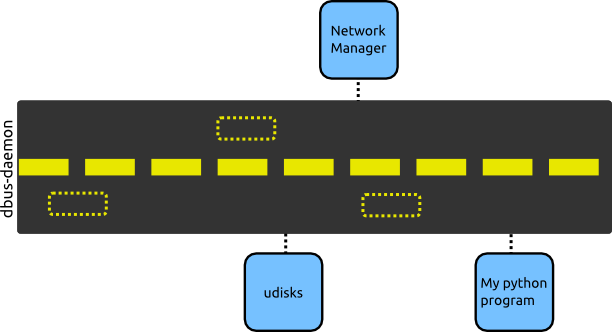 As you might notice, udisks doesn't have a straighforward method that we can call to list all devices. So someone has to dig through the things, read UDisks2 dbus API or simply google. Luckily for you, I did the digging. You should get a blob of stuff including any mounted drives. Indeed you still have to dig through things but at least you shouldn't be totally lost by now. So in order to access any property of any object we need to use a very specific interface: 'org.freedesktp.DBus.Properties'. Notice that the object path '/org/freedesktop/UDisks2/drives/MBED_microcontrolleur_10105a42e87da33c103dccfb6bc235360a97' has to be replaced with one that actually exists on your computer. Then we open the correct interface and call GetAll(). The argument to GetAll() is the interface name that you want to get the properties of. As I told many times.. Dbus is so damn confusing! Anyway, the good thing is that the 'org.freedesktp.DBus.Properties' interface has only three methods we need to learn: Get(), Set(), GetAll(). So things can't get more complicated than this. For our use the only thing we need from these libraries are the so called loops. The loops are needed since someone has to be looping somewhere waiting for the signal to arrive. We could probably create our own loop but I am not so sure how easy it would be. You could take that route if you want, may Zoidberg Jesus guide you the way. Below I mention a bit on what excactly Glib and Gobject is, just in case you're curious and bored to google. Glib is a library that originally was developed to be used with Gnome's GTK. However later it split from it so that it could be used on any Linux machine. Many programs use the Glib library since it's it provides so many things that is hard to find (in C) in a general-purpose library. Some things offered are data-structures like hash tables and linked lists (just keep in mind next time you will need any of this). Gobject is built on top of Glib. What it does is merely allow object oriented programming with the Glib. Since Glib is a C library, it doesn't have object-oriented things lik objects, inheritance, classes etc. For that reason Gobject was developed. In our case, the reason we use it is to easily be able and change things on the loop without having to dig inside the C code.